Meetings I facilitate should be inspiring and meaningful. That is my aspiration. This needs preparation. And practice. I facilitated many meetings; and each time I see myself as learner. Inspired by Johnnie Moore’s simple rules and the Liberating Structures’ Min Specs I started writing down my guiding rules (I also call them my mantras) for facilitation. I asked myself: What are my most important simple rules that I want to respect when I facilitate a workshop? Here my list of my most important rules – my Min Spec. I am happy to share them so I can learn form others. 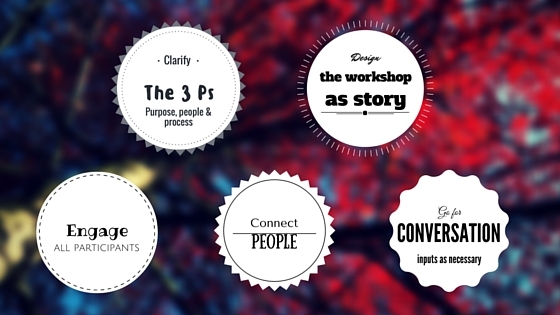 Design the workshop as story with a beginning, a middle and an end. Engage all participants and make it playful. Invest time in connecting people. Go for as much conversation as possible and as little inputs as necessary. I have more aspirations. Inspired by Liberating Structures I tried to boil the number of my rules down to the essential ones. What are your most important rules for facilitation? I am curious.